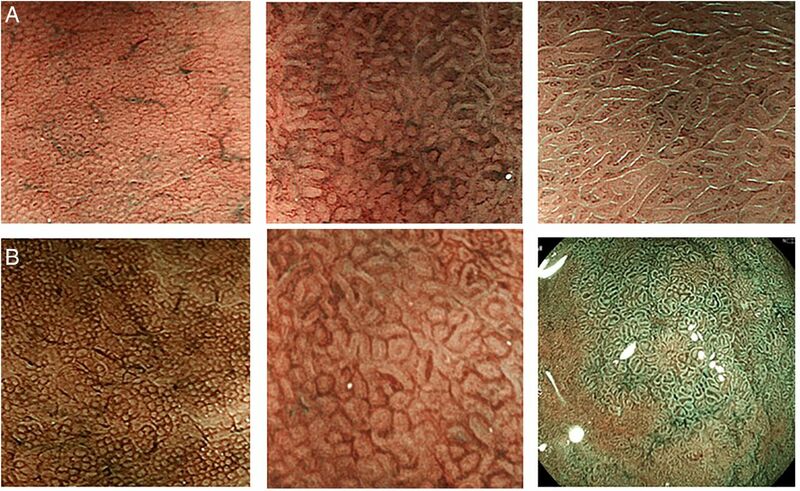 For decades endoscopic ‘gastritis,’ gastric erosions and even histological findings of gastric inflammation have failed to attract much attention from clinicians as the majority of patients with these findings remain asymptomatic. Although gastritis is often used to describe dyspeptic symptoms, the presence of such symptoms correlates poorly with histological or endoscopic gastritis. Although the term ‘gastritis’ is still used as a concept to explain dyspeptic symptoms, gastritis as a term refers to gastric inflammation, often accompanying structural mucosal changes.1 This gastric inflammation (gastritis) has long been associated with peptic ulcer, gastric cancer and pernicious anaemia, but the cause or causes of gastritis remain poorly understood. The discovery that Helicobacter pylori (H. pylori) was a cause of gastritis2 focused attention on the aetiology, natural history and prognosis of gastritis. The current International Statistical Classification of Diseases and Related Health Problems (ICD-10), issued in 1989 by the International Conference for the Tenth Revision of the ICD was endorsed by WHO at the 43rd general assembly in 1990 and has been used for disease statistics since 1994 among member countries of WHO. In the ICD-10, all the digestive diseases are classified under K code with different two-digit numbers.6 However, H. pylori was not integrated into gastritis classification in the gastritis section (K29) of ICD-10, even though H. pylori gastritis is the predominant type of gastritis and clinically by far the most relevant because of its predisposing role of severe gastroduodenal complications.3–5 Moreover, the current ICD-10 classification of gastritis is not organised according to aetiology but is merely a mixture of phenotype and aetiology and also includes duodenitis (box 1). Therefore, a revision of the gastritis and duodenitis classification based on all the possible aetiologies was proposed after the working group meeting for the ICD-11 revision held in Tokyo in 2010 and submitted as the ICD11 β foundation component. However, in the ICD11 β foundation classification (box 2), the original plan was changed. In an attempt to gather broader opinions on the rationale of the new classification system originally proposed to ICD-11, we devoted one section to this important issue at this meeting. As stated above, if H. pylori gastritis is categorised as an infectious disease, the inclusion of H. pylori gastritis-associated dyspeptic symptoms as a ‘functional disease’ entity poses a special challenge,7 ,8 despite it being implicated in the pathogenesis of functional dyspepsia (FD) symptoms.9 Despite the definition given by Rome III,9 a conceptual ambiguity on how to deal with H. pylori gastritis-associated dyspeptic symptoms in the context of the clinical assessment of FD still remains.5 ,10–12 Accordingly, guidelines and meta-analyses that included dyspepsia associated with H. pylori under the umbrella of ‘functional dyspepsia’5 ,10–12 would require reconsideration in accordance with advances made in the area of H. pylori gastritis. Third, there has been significant technical progress in diagnostic tools for GI diseases. Advanced endoscopy with image-enhanced modalities and magnification allows diagnosis of gastritis with a high degree of accuracy, even before histological confirmation.13–15 Furthermore, non-invasive diagnostic tests such as the [13C]-urea breath test, faecal antigen test and serological parameters serve as surrogate markers of H. pylori gastritis and indicators of gastritis severity.5 Classification systems for grading gastritis such as the Operative Link for Gastritis Assessment (OLGA) and Operative Link for Gastric Intestinal Metaplasia Assessment (OLGIM) have also been proposed,16–18 in addition to the internationally accepted Sydney System,19 ,20 and their utility needs to be evaluated and agreed upon. 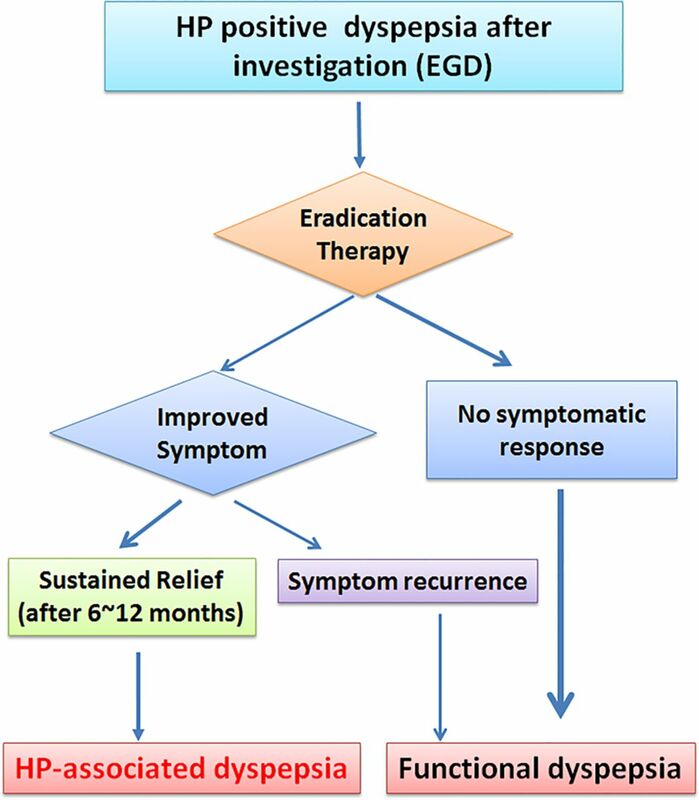 In 2013, the Japanese government insurance policy approved eradication therapy for H. pylori-positive gastritis after endoscopic examination, to exclude more serious diseases such as ulcer and cancer, in line with the Japanese guidelines for H. pylori management.11 However, no global consensus has been published on when to recommend eradication therapy for H. pylori gastritis and how to follow up after eradication. Consensus level was predefined as ≥80% of the sum of the votes of strongly agree plus agree with minor reservation. After the first round of voting, moderators in each subgroup initiated further discussion about the statements which had failed to reach consensus. After this discussion, the revised statements were uploaded to the electronic voting system for a second round of voting. This process resulted in several CQs being modified for improved understanding and to better fit the statements. At the second round of voting, faculty members were asked to provide recommendation as to the grade of evidence and the levels of supporting evidence for the statements. Recommendation grade and evidence level were based on the GRADE system21 ,22 (see online supplementary table S1 and S2). Electronic reminders were automatically sent to all faculty members twice (3 days and 1 day before the closing dates). Voting rates of 100% were achieved in the two voting sessions. For management of conflict of interest (COI), each member was asked to present COI status according to the JSGE guidelines. If a relevant COI had existed, that person would have been asked not to vote, in accordance with the recent consensus,23 but no such case was encountered. The majority of the funding was provided by JSGE with a hand-reach support from industries, which were otherwise not involved in the planning, organisation or manuscript writing and did not join in the discussions. CQ1. Is the current ICD-10 classification for gastritis appropriate? The discovery of H. pylori had not been taken into account, possibly because even though release came after the discovery of Campylobacter pylori (H. pylori), the role of H. pylori in disease was still controversial. The recognition of H. pylori infection as the primary cause of chronic gastritis proved to be a breakthrough that reopened the chapter on gastritis and its role in disease.2 ,24 ,25 At present, no classification of gastritis would be complete without including H. pylori as the aetiological cause. CQ2. Is the proposed ICD-11 classification for gastritis appropriate? Although the ICD-10 has been updated regularly to accommodate new diseases and concepts, WHO recognised the necessity of overall systematic changes in the ICD and decided to revise the current ICD-10 to ICD-11 in 2007. As the intermediate process for this revision, the ICD11 β version was formulated with input from various scientific advisory groups. This version was open to the public so that opinions from various interest groups and a broader range of medical specialists could be reflected before compiling the ICD-11. ICD11 β foundation component consists of the core of the ICD-11 classification from which mortality and morbidity classifications will derive. However, it remains a draft and can be changed from time to time before finalisation of ICD-11 (for more details, please visit http://www.who.int/classifications/icd/revision/betaexpectations/en/). The updated Sydney System has been globally implemented into clinical practice and requires proper assessment of all the relevant characteristics of H. pylori gastritis including atrophy and intestinal metaplasia at different gastric subsites.19 ,20 Categorising gastritis is clinically relevant because the ‘phenotype’ of H. pylori gastritis determines the risk of progression to gastroduodenal complications. Severity and extent of atrophic gastritis and intestinal metaplasia are well established as indicators of the increased risk for developing gastric cancer.31 ,39 ,40 Similarly, severe H. pylori-induced corpus gastritis is associated with an increased risk for gastric cancer.31 ,41 New staging systems for the characterisation of gastritis have been introduced to assess the gastric cancer risk. They are used in clinical practice and are either based on the severity of atrophy in various gastric subsites (OLGA)16 ,17 or on intestinal metaplasia (OLGIM).18 Both systems, discussed further in section 3, are reported to have a positive impact on patient management. There is a significant variability in the interindividual expressions of gastric mucosal structural damage and accordingly the associated physiological perturbations also vary.30 ,35 H. pylori gastritis may remain clinically unapparent or evolve into severe complications. The rate of progression is unpredictable. The most severe clinical expression is gastric cancer, which is often incurable by the time of diagnosis. Diagnostic algorithm of Helicobacter pylori-associated dyspepsia. Patients with dyspeptic symptoms after negative routine laboratory and upper gastrointestinal endoscopy except for positive H. pylori tests, should undergo eradication therapy. If sustained symptomatic relief is obtained, their dyspeptic symptoms are considered as H. pylori-associated dyspepsia. On the other hand, if dyspeptic symptoms do not resolve or recur after eradication therapy, they are judged to have functional dyspepsia. EGD, oesophagastroduodenoscopy. Eradication therapy studies have confirmed that a subset of H. pylori-infected patients with FD is relieved of dyspeptic symptoms by eradication therapy.12 ,56–61 To date, only a limited number of studies have directly compared eradication therapy with other treatments that are used for FD, such as PPIs or prokinetic therapy.57 ,60 ,61 Hence, although the symptomatic gain takes at least 6 months,57 ,60 ,61 eradication is the preferred treatment. Future trials should compare eradication with treatment modalities other than placebo in H pylori-infected patients with chronic dyspeptic symptoms and a negative endoscopy. As indicated in statements 8A and 8B and in agreement with the Rome III criteria,9 ,62 H. pylori infected dyspeptic patients with negative endoscopy who experience sustained symptom control are labelled as having H. pylori-associated dyspepsia. Conversely, when symptoms do not benefit in the long term from successful eradication, this indicates that H. pylori gastritis did not cause the symptoms in these patients. Consequently, they can keep the label ‘functional dyspepsia’ (figure 1). Conventional endoscopy is, in most hands, an inadequate tool for diagnosing atrophy and intestinal metaplasia and therefore it remains mandatory that a biopsy is carried out, allowing histomorphological assessment of the gastric mucosa according to the Sydney classification.19 ,20 However, image-enhanced endoscopy has improved the accuracy and reproducibility of endoscopic diagnosis of premalignant gastric lesions. This includes chromoendoscopy,65 high-resolution magnification endoscopy66 ,67 and image-enhanced endoscopy combined with magnification15 ,68–72 (figure 2). These methods are now routinely available in Japan and will be increasingly used worldwide. Adequate evaluation of the stomach mucosa with each of these methods requires appropriate training66 and offers the advantage of targeted biopsies. Image enhanced endoscopy. (A) Narrow band imaging (NBI) of the gastric mucosa. Round homogeneous sized pits with regularly arranged collecting venules are shown (left). This pattern (regular arrangement of collecting venules) named ‘RAC’ pattern in the corpus mucosa highly indicates a Helicobacter pylori negative state.13 In the H. pylori-infected mucosa with inflammation, pit patterns are elongated, varied in sizes and shapes with spaces between them. Collecting venules are obscured owing to inflammation (centre).14 When intestinal metaplasia develops, the pit pattern is further elongated with light blue lines (light blue crest sign) decorating the pits margins (right).66 The images were provided by Dr Kazuyoshi Yagi. (B) Blue laser imaging (BLI) of the gastric mucosa. BLI is a new modality of image enhancement.70 The BLI-bright mode can easily obtain lower magnification images, similar to the NBI images in (A) (left). With BLI-magnification mode, further mucosal details including periglandular capillary networks (red coloured circles surrounding the pits) are seen (centre). BLI endoscopy is useful for identifying the area of intestinal metaplasia where greenish coloured elongated pit patterns predominate (right). The images were provided by Dr Hiroyuki Osawa, Jichi Medical University. The interobserver reproducibility was improved for intestinal metaplasia compared with atrophic gastritis, and the correlation between the severities of gastritis remained at least as strong.18 Subsequent studies with both the OLGA and OLGIM systems showed a higher gastric cancer risk in patients in stage III or IV of OLGA or OLGIM.82–84 As a result, upper gastrointestinal surveillance endoscopy should be offered to patients in these subcategories. H. pylori is a major human pathogen that causes chronic and progressive gastric mucosal damage and is aetiologically related to peptic ulcer, gastric cancer and gastric atrophy. It is also closely associated with gastric MALT lymphoma, dyspepsia, hyperplastic gastric polyps and idiopathic thrombocytopenic purpura.5 ,12 ,46 ,47 ,61 ,98–104 H. pylori-positive individuals are also the major reservoir for transmission of the infection. The incidence of gastric cancer increases with age, which is a surrogate marker for the time required for progression of atrophic gastritis. When atrophic gastritis becomes extensive and severe, the risk increases exponentially. Cancer is the culmination of a multistep process of genetic instability, with cancer cells possessing mutations in coding regions, somatic gene rearrangements and epigenetic changes such as methylation. Current data are consistent with the notion that H. pylori eradication halts the progression of damage and reduces or eliminates the H. pylori-associated events that increase genetic instability in the gastric mucosa. These include infection-associated DNA double-strand breaks,118 impaired DNA mismatch repair,119 aberrant activation-induced cytidine deaminase expression, which induces nucleotide alterations involved in DNA mutations,120 aberrant methylation in a number of gene promoters in the gastric mucosa, including cell growth-related genes, DNA-repair genes, tumour-suppressor genes, the cell adherence gene E-cadherin and CpG islands of microRNA genes121–123 and aberrant microRNA expression.124 H. pylori infection also causes an inflammatory response with mucosal infiltration of acute and chronic inflammatory cells. Cancer risk is increased in relation to the ability of the infecting strain to cause inflammation (eg, those possessing the Cag pathogenicity island). However, all strains cause inflammation, and gastric cancer is associated with infections lacking putative virulence factors. Thus all H. pylori infections should be considered pathogenic and should be eradicated. Long-term follow-up such as regular endoscopic surveillance should be based on estimating the risk of developing gastric cancer after H. pylori eradication (ie, risk stratification).95 ,133 Cancer risk correlates with the extent and severity of atrophic gastritis and risk stratification should be confirmed using a validated histological risk scoring systems such as OLGA or OLGIM.16–18 In areas with proven expertise in endoscopic scoring, a system such as that of Kimura and Takemoto can be used initially, although histological confirmation is still recommended.134 ,135 Patients whose H. pylori infection was diagnosed non-invasively (eg, urea breath test or stool antigen) should be considered for histological assessment. These patients should include those within the age range in which atrophic changes are common in that population and those with a history of gastric ulcer as well as those with a pretreatment serum pepsinogen I of ≤70 ng/mL and a pepsinogen I:II ratio ≤3.136–138 All those at especially high risk, including those at risk for intraepithelial neoplasia (dysplasia) or early gastric cancer, are candidates for regular endoscopic surveillance. The discovery of H. pylori has revolutionised the pre-existing concepts of gastritis by assigning a specific aetiology to this entity underlying PUD and gastric cancer. The majority of these serious conditions are manifestations developed on the background of chronic gastritis caused by a unique infectious agent, H. pylori. For PUD, guidelines unanimously recommend eradication as the primary treatment for those with positive H. pylori tests. However, there has been no consensus on how and when to manage individuals with H. pylori gastritis itself, which is crucial to the efficiency of gastric cancer prevention because most patients with chronic gastritis may remain asymptomatic until the appearance of severe complications. Furthermore, both gastritis and duodenitis were recognised as important causes of upper gastrointestinal bleeding,140 encouraging our attention to these conditions now that anti-thrombotic therapies are increasingly being used. To further compromise the concept of gastritis as a significant clinical entity, the term ‘gastritis’ has historically, but wrongly, been used as a substitute for a clinical diagnosis of FD. Historical studies, however, failed to demonstrate a significant association between histological findings of gastritis and the dyspeptic symptom complex.141 ,142 Hence, a potential pathogenetic role for H. pylori in causing dyspeptic symptoms was initially considered doubtful and its eradication in FD controversial.143 ,144 Meta-analysis of a large number of controlled trials with longer follow-up confirmed that eradication of H. pylori in patients with FD conveys a small but statistically significant benefit.12 Consequently, dyspepsia attributable to H. pylori gastritis involves an underlying organic cause and should be excluded from the FD category. Additionally, ‘dyspeptic’ patients should not automatically be labelled as having ‘gastritis’ without any histological confirmation. We thank the Japanese Society of Gastroenterology (JSGE) for providing financial support, enabling this global consensus meeting. Technical support by Omura Publishing Co Ltd and Mr Osamu Iimura of the JSGE is greatly appreciated. We also thank Japan Convention Service Co Ltd for their excellent management of the conference.
. Functional gastrodudenal disorders. In Drossman DA, Corazziari F, Delvaux M, et al. eds. Rome III: the functional gastrointestinal disorders. 3rd edn. McLean, VA: Denon Associates, Inc, 2006:419–86.
. Eradication of Helicobacter pylori for non-ulcer dyspepsia. Cochrane Database Syst Rev 2011;16(2):CD002096.
. Attempt to fulfil Koch's postulates for pyloric Campylobacter. Med J Aust 1985;142:436–9.
. Ingestion of Campylobacter pyloridis causes gastritis and raised fasting gastric pH. Am J Gastroenterol 1987;82:192–9.
. Prevalence of Helicobacter pylori in non-ulcer dyspepsia. Aliment Pharmacol Ther 1995;9(Suppl 2):53–8.
. Effect of Helicobacter pylori infection on the severity of gastroduodenal mucosal injury after the acute administration of naproxen or aspirin to normal volunteers. Am J Gastroenterol 1991;86:735–7.
. Cost-effectiveness of alternative approaches in the management of dyspepsia. Int J Technol Assess Health Care 2003;19:446–64.
. Initial management strategies for dyspepsia. Cochrane Database Syst Rev 2009;7:CD001961.
. Gastritis OLGA-staging and gastric cancer risk: a twelve-year clinico-pathological follow-up study. Aliment Pharmacol Ther 2010;31:1104–11.
. A strain-specific antigen in Japanese Helicobacter pylori recognized in sera of Japanese children. Clin Diagn Lab Immunol 2005;12:1280–4.
. An evidence-based approach to the management of uninvestigated dyspepsia in the era of Helicobacter pylori. Canadian Dyspepsia Working Group. CMAJ 2000;162:S3–23.
. Disappearance of hyperplastic polyps in the stomach after eradication of Helicobacter pylori. A randomized, clinical trial. Ann Intern Med 1998;129:712–15.
. The Oslo study of the natural course of untreated syphilis. An epidemiologic investigation based on re-study of the Boeck-Burrsgaard material. Med Clin North Am 1964;48:613–23.
. H. pylori eradication therapy vs. antisecretory non-eradication therapy (with or without long-term maintenance antisecretory therapy) for the prevention of recurrent bleeding from peptic ulcer. Cochrane Database Syst Rev 2004;(2):CD004062.
. Changes in gastric mucosa following eradication of Helicobacter pylori. Mod Pathol 1993;6:281–9.
. Chronic gastritis. Bull NY Acad Med 1939;15:322–37.
. The role of Helicobacter pylori in nonulcer dyspepsia. A debate—for. Gastroenterol Clin North Am 1993;22:141–51.
. The role of Helicobacter pylori in nonulcer dyspepsia. A debate—against. Gastroenterol Clin North Am 1993;22:153–67. Collaborators List of faculty members and affiliations (alphabetical order of family names): Takeshi Azuma, Department of Gastroenterology, Kobe University; Franco Bazzoli, Department of Gastroenterology, University of Bologna; Francis Ka-Leung Chan, Department of Medicine and Therapeutics, The Chinese University of Hong Kong; Minhu Chen, Department of Gastroenterology, The first affiliated hospital, SunYat-sen University; Naoki Chiba, McMaster University; Tsutomu Chiba, Department of Gastroenterology, Kyoto University; Luiz Gonzaga Vas Coelho, Department of Internal Medicine, Faculty of Medicine, Federal University of Minas Gerais; Francesco Di Mario, Department of Clinical Experimental Medicine, University of Parma; Kwong Ming Fock, Department of Gastroenterology, Changi General Hospital; Yasuhiro Fukuda, Sasayama Medical Center, Hyogo College of Medicine; Takahisa Furuta, Center for Clinical Research, Hamamatsu University School of Medicine; Robert Maximilian Genta, Department of Pathology, Miraca Life Sciences Research Institute and University of Texas Southwestern; Khean-Lee Goh, Division of Gastroenterology and Hepatology, Department of Medicine, University of Malaya; Masanori Ito, Department of Gastroenterology and Metabolism, Hiroshima University, Tomonori Kamada, Department of Internal Medicine, Kawasaki Medical School; Peter Harry Katelaris, Department of Gastroenterology, Concord Hospital, University of Sidney; Mototsugu Kato, Division of Endoscopy, Hokkaido University Hospital; Takashi Kawai, Endoscopy Center, Tokyo Medical University Hospital; Nayoung Kim, Department of Internal Medicine, Seoul National University Bundang Hospital; Ryuji Kushima, Department of Pathology, Shiga University of Medical Science; Varocha Mahachai, Division of Gastroenterology, Chulalongkorn University Hospital; Takeshi Matsuhisa, Nippon Medical School Tama Nagayama Hospital; Francis Mégraud, INSERM U853 and Department of Bacteriology; Hiroto Miwa, Department of Gastroenterology, Hyogo College of Medicine; Kazunari Murakami, Department of Gastroenterology, Oita University; Colm Antoine O'Morain, Faculty of Health Sciences, Trinity College; Massimo Rugge, Department of Pathology, Padova University; Kiichi Sato, International University of Health and Welfare; Tadashi Shimoyama, Department of Gastroenterology and Hepatology, Hirosaki University; Akiko Shiotani, Department of Internal Medicine, Kawasaki Medical College; Toshiro Sugiyama, Department of Internal Medicine, Toyama University; Hidekazu Suzuki, Department of Gastroenterology, Keio University; Kazuyoshi Yagi, Department of Medicine, Niigata Prefectural Yoshida Hospital; Ming-Shiang Wu, Department of Internal Medicine, National Taiwan University.